Chinese President Xi Jinping will pay state visits to Spain, Argentina, Panama, and Portugal from November 27 to December 5, China’s Foreign Ministry announced on Friday. Xi will also attend the G20 leaders’ meeting in Buenos Aires, Argentina, which will be held from November 30 to December 1, according to the ministry. 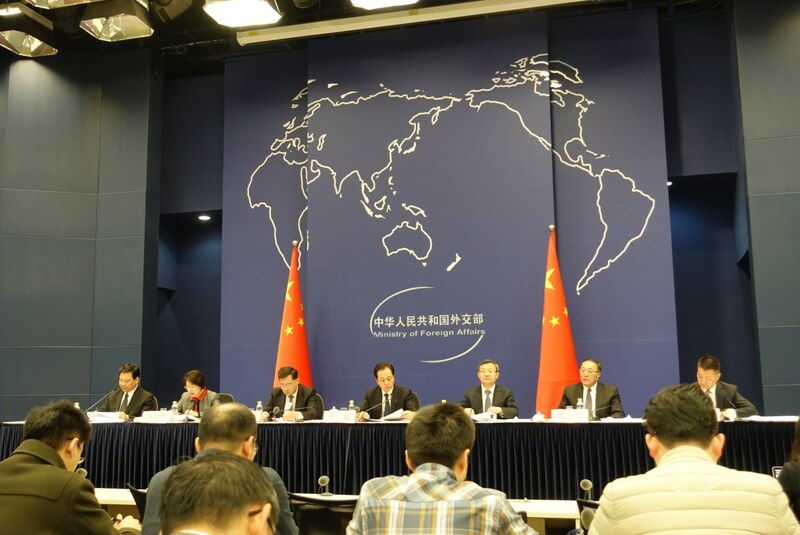 The Vice Ministers of Foreign Affairs Wang Chao and Qin Gang, Assistant Minister of Foreign Affairs Zhang Jun, Vice Minister of Finance Zou Jiayi, Vice Minister of Commerce Wang Shouwen and Deputy Governor of the People’s Bank of China Chen Yulu were invited to brief the press on Xi’s upcoming visit. According to Wang Chao, the visit will inject new impetus to the development of China-EU relations in the new era and explore new possibilities for cooperation under the Belt and Road Initiative. He pointed out President Xi’s first visit to the EU after the 19th CPC National Congress and 13 years after Chinese leader’s last visit to Spain and eight years to Portugal. As this year marks the 45 years anniversary of the establishment of China-Spain diplomatic ties and next year marks the 40 years anniversary of the establishment of China-Portugal diplomatic ties, Xi’s tour to these two EU countries are meaningful. On Xi’s visit to Spain and Portugal, Wang also mentioned that the two countries are China’s traditional friends and comprehensive strategic partners. Qin Gang said the Chinese president would pay a state visit to Argentina and Panama from December 2 to 3. As comprehensive strategic partners, China and Argentina have always upheld mutual respect, equality, and win-win cooperation over the past 46 years of diplomatic ties, Qin said. President Xi will visit Panama for the first time since the establishment of diplomatic ties between the two countries. Although it has not been long since Panama established diplomatic ties with China, the two countries have close exchanges as China is Panama’s second largest trading partner, Qin noted. During his visit, Xi will hold talks with Panamanian President Juan Carlos Varela and exchange views on issues of shared interest. G20 is not WTO and G20 cannot replace the role of the WTO to make decisions on WTO, Zhang emphasized during Friday’s press conference. Describing November as a prime season for Chinese diplomacy with many highlights, Zhang introduced President Xi who just attended the successful APEC Economic Leaders’ Meeting, will attend the G20 Leaders’ Summit in Buenos Aires from November 30 to December 1, at the invitation of the Argentina president. China attaches great importance to the G20 summit, said Zhang adding that in 2016, China held a successful G20 Hang Zhou summit and it is the sixth time in a row for President Xi to attend or preside over the G20 summit. He pointed out although the world economy in overall is growing; downward pressure still exists due to protectionism and unilateralism. Zhang added the risks of the world economy’s development might also result from the adjustment of monetary policies of an advanced economy which disturbed some emerging markets, lagging global governance and imbalanced international development. The international community hoped the coming Argentina G20 summit could lead the world economy on a strong sustainable balanced and inclusive path, said he. Under the theme of “building consensus for fair and sustainable development”, Zhang introduced that the activities for the coming G20 summit will mainly include three sessions and the closed-door meeting. The leaders will discuss topics covering world economy, trade, investment, digital economy, sustainable development, infrastructure, and climate, Zhang said and added that President Xi would elaborate China’s position on those topics and exchanges views with other leaders during the summit. When asked China’s attitudes China’s expectation to the G20 summit since the APEC Economic Leaders’ Meeting failed to reach a consensus, Zhang stressed that China is ready to participate the G20 summit in a constructive and positive way and make China’s contributions. China expressed regret on the result that the APEC meeting failed to reach a consensus, said Zhang and explained the reason is some countries refused to include clauses that proposed by most countries, and insisted on adding clauses most countries disagree. Thus some countries tried to pass meeting document without consensus, which violated APEC’s consensus through consultation principle. China hopes the G20 could uphold multilateralism and address common challenges through collective actions; he said and added that all parties must insist on partnership and mutual trust. Zhang also said as the world multilateral trading system is currently suffering from shock, China hopes the G20 summit could also uphold open development and reaffirm its long-standing position on opposing protectionism. China has made his position clearly many times that China supports necessary reform of WTO but the reform should uphold WTO’s core principles and values as free, open and nondiscriminatory to developing countries, Zhang added. He also said China hopes G20 summit could focus on the future and dig out the impetus of development. G20 should give priority to 2030 Sustainable Development Goals and Paris Agreement, added Zhang. The Chinese assistant foreign minister also said BRICS leaders would also hold an informal meeting during the G20 summit period aiming to implement the consensus reached in Johannesburg summit and enhance BRICS cooperation. President Xi’s meeting with U.S. President Donald Trump, the first after the trade war, is another key watching focus; while the Vice Minister of Commerce Wang Shouwen noted two sides have recently had some constructive discussions based on the consensus reached during the recent phone conversation between two leaders. Trade conflicts are caused by U.S.’s trade protection measures and damages two countries interests and global trade conflicts, Wang Shouwen said and added that the conflicts have both short term and long term negative influences. He said China noticed that the U.S. side expressed willingness to manage the differences through two leader’s summit. China hopes two sides could respect each other on the basis of respective concerns to keep own promise and find solutions, Wang Shouwen stressed. He added China has confidence and expectation that the coming meeting between two leaders can ease two countries’ trade tensions.